Do you have a comment or an idea to share to help make our club better? Visit our Club Members Discussion Forum, and make yourself heard! Our meeting last night is one which I'm sure will forever PROTRUDE in people's minds, and for a number of reasons. We reconvened from the summer break and it was superb to see so many familiar faces with thirteen members in attendance. Additionally we had three visiting toastmasters in Finbarr Harty, Tom Hebel and Kevin Murphy. Six guests also came to enjoy the Toastmaster experience! Last night’s AGM was a busy way to wrap up the year with two guests, as well as two visiting toastmasters, Tom and Krystal, who both partook in the meeting as Toastmaster and Table Topic Master respectively. 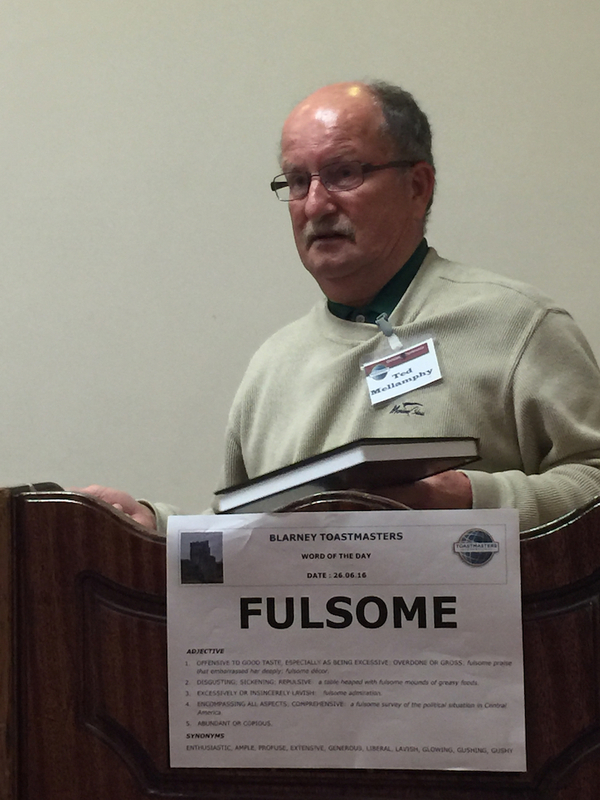 As you can guess, the word of the day, chosen by Grammarian Sharon O'Neill was "Fulsome" and the winner of the prize for most uses of the word was the instigator of this prize system, Ted Mellamphy! The VPE may plan ahead and schedule speeches for several meetings at one time using the Schedule Speeches screen. A meeting replete with great speech and language! The Club Success Continues Unabated! An Amalgam of great speaking! Black Cat here we come! A Good Meeting and Great Area Competitions!